For the Chinese branch of this school, see Tiantai. For other uses, see Tendai (disambiguation). Tendai (天台宗, Tendai-shū) is a Japanese school of Mahayana Buddhism, a descendant of the Chinese Tiantai or Lotus Sutra school. Although Tendai (Chin., T'ien-t'ai) has the reputation of being a major denomination in Japanese history, and the most comprehensive and diversified school of Chinese Buddhism, it is almost unknown in the West. This meagre presence is in marked contrast to the vision of the founder of the movement in China, T'ien-t'ai Chih-i (538-597), who provided a religious framework which seemed suited to adapt to other cultures, to evolve new practices, and to universalize Buddhism. The Tiantai was founded by Zhiyi and its teaching was first brought to Japan by the Chinese monk Ganjin (鑑眞) in the middle of the 8th century, in what became the short-lived Ritsu school, but it was not widely accepted. In 805, the Japanese monk Saichō (最澄; also called Dengyō Daishi 伝教大師) returned from China with new Tiantai texts and made the temple that he had built on Mount Hiei (比叡山), Enryaku-ji (延暦寺), a center for the study and practice of what became Japanese Tendai. Philosophically, the Tendai school did not deviate substantially from the beliefs that had been created by the Tiantai school in China. However, what Saichō transmitted from China was not exclusively Tiantai, but also included Zen (禅, trad. 禪), the esoteric Mikkyō (密教), and Vinaya School (戒律) elements. The tendency to include a range of teachings became more marked in the doctrines of Saichō's successors, such as Ennin (圓仁) and Enchin (圓珍). However, in later years, this range of teachings began to form sub-schools within Tendai Buddhism. By the time of Ryōgen, there were two distinct groups on Mt. Hiei: the Sammon "Mountain Group" (山門派) who followed Ennin and the Jimon "Temple Group" (寺門派) who followed Enchin. 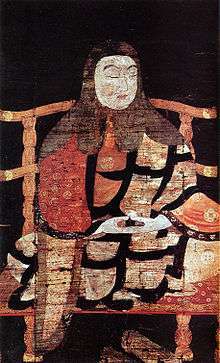 The Tendai sect flourished under the patronage of the Imperial House and the noble classes, particularly the Fujiwara clan. In 794, the Imperial capital was moved to Kyoto. Tendai Buddhism became the dominant form of mainstream Buddhism in Japan for many years, and gave rise to most of the developments in later Japanese Buddhism. Nichiren, Hōnen, Shinran and Dōgen—all famous thinkers in non-Tendai schools of Japanese Buddhism—were all initially trained as Tendai monks. Japanese Buddhism was dominated by the Tendai school to a much greater degree than Chinese Buddhism was by its forebearer, the Tiantai. Due to its patronage and growing popularity among the upper classes, the Tendai sect became not only respected, but also politically and even militarily powerful. During the Kamakura period, the Tendai school used its patronage to try to oppose the growth of rival factions—particularly Nichiren Buddhism, which began to grow in power among the merchant middle class, and Pure Land Buddhism, which eventually came to claim the loyalty of many of the poorer classes. Enryaku-ji, the temple complex on Mt. Hiei, became a sprawling center of power, attended not only by ascetic monks, but also by brigades of sōhei or warrior-monks who fought in the temple's interest. As a result, in 1571 Enryaku-ji was razed by Oda Nobunaga as part of his campaign to unify Japan. Nobunaga regarded the Mt. Hiei monks as a potential threat or rival, as they could employ religious claims to attempt to rally the populace to their side. The temple complex was later rebuilt, and continues to serve as the head temple of the Tendai school today. The first characteristic of the Japanese Tendai school is its advocacy of a comprehensive Buddhism, [...] the idea that all the teachings of the Buddha are ultimately without contradiction and can be unified in one comprehensive and perfect system. Chih-i, founder of T'ien-t'ai philosophy and practice attempted this synthesis on the basis of the ekayāna doctrine of the Lotus Sutra. Tendai Buddhism has several philosophical insights which allow for the reconciliation of Buddhist doctrine with aspects of Japanese culture such as Shinto and traditional aesthetics. It is rooted in the idea, fundamental to Mahayana Buddhism, that Buddha-hood, the capability to attain enlightenment, is intrinsic in all things. Also central to Mahayana is the notion that the phenomenal world, the world of our experiences, fundamentally is an expression of the Buddhist law (Dharma). This notion poses the problem of how we come to have many differentiated experiences. Tendai Buddhism claims that each and every sense phenomenon just as it is is the expression of Dharma. For Tendai, the ultimate expression of Dharma is the Lotus Sutra. Therefore, the fleeting nature of all sense experiences consists in the Buddha's preaching of the doctrine of Lotus Sutra. The existence and experience of all unenlightened beings is fundamentally equivalent and undistinguishable from the teachings of the Lotus Sutra. In the early decades of the twentieth century, Buddhologist Shimaji Daito (1875-1927) introduced to the Japanese academic world a new interpretive category, which he called "original enlightenment thought" (Jpn. hongaku shiso). By this term he meant, in general, those strands of Buddhist thought, most prominent in East Asia and especially in Japan, that regard enlightenment or the ideal state as inherent from the outset and as accessible in the present, rather than as the fruit of a long process of cultivation. More specifically, Shimaji used "original enlightenment thought" to designate the intellectual mainstream of medieval Japanese Tendai Buddhism. In this medieval Tendai context, "original enlightenment thought" denotes an array of doctrines and concepts associated with the proposition that all beings are enlightened inherently. Not only human beings, but ants and crickets, mountains and rivers, grasses and trees are all innately Buddhas. The Buddhas who appear in sutras, radiating light and endowed with excellent marks, are merely provisional signs. The "real" Buddha is the ordinary worldling. Indeed, the whole phenomenal world is the primordially enlightened Tathagata. One of the adaptations by the Tendai school was the introduction of esoteric ritual into Tendai Buddhism, which was later named Taimitsu by Ennin. Eventually, according to Tendai Taimitsu doctrine, the esoteric rituals came to be considered of equal importance with the exoteric teachings of the Lotus Sutra. Therefore, by chanting mantras, maintaining mudras, or performing certain meditations, one is able to see that the sense experiences are the teachings of Buddha, have faith that one is inherently an enlightened being, and one can attain enlightenment within this very body. The origins of Taimitsu are found in Chinese Tangmi, similar to the lineage that Kūkai encountered in his visit to China during the Tang Dynasty, and Saichō's disciples were encouraged to study under Kūkai. As a result, Tendai esoteric ritual bears much in common with the explicitly Vajrayana tradition of Shingon Buddhism, though the underlying doctrines may differ somewhat. Tendai doctrine allowed Japanese Buddhists to reconcile Buddhist teachings with the native religion of Japan, Shinto, and with traditional Japanese aesthetics. In the case of Shinto, the difficulty is the reconciliation of the pantheon of Japanese gods, as well as with the myriad spirits associated with places, shrines or objects, with the Buddhist doctrine that one should not concern oneself with any religious practice save the pursuit of enlightenment. However, priests of the Tendai sect argued that Kami are simply representations of the truth of universal buddhahood that descend into the world to help mankind. Thus, they were seen as equivalent with Buddhas. This doctrine, however, regards Kami as more sacred. While Buddhas represent the possibility of attaining enlightentment through many lifetimes of work and devotion to Dharma, Kami are seen to be manifest representations of universal buddhahood. They exemplify the doctrine that all things are inherently enlightened and that it is possible for a person of sufficient religious faculties to attain enlightenment instantly within this very body.. Those Kami that Shinto regards as violent or antagonistic to mankind are considered as simply supernatural beings that are violent and evil. The Buddha taught a Middle Way between the extremes of sensual indulgence and self-mortification. In the context of the Four Noble Truths this meant ceasing the craving (Sanskrit tṛṣṇā) of worldly desire and attachment, thus putting an end to suffering (dukkha). In early Buddhism, the emphasis, especially for monastics, was on avoiding activities that might arouse worldly desires. Buddhist art and poetry focused on overtly Buddhist themes. This tendency toward renunciation created a potential conflict with mainstream culture in China and Japan when Buddhism was introduced. Shedding worldly pleasures and attachments might seem to require that such flowers of culture as poetry, literature, and visual arts be given up. However, later Mahayana views developed a different emphasis. By claiming that the phenomenal world is not distinct from Dharma, Tendai doctrine allows for the reconciliation of beauty and aesthetics with Buddhist teachings. Things are to be seen just as they are, as expressions of Dharma. Poetry, instead of being a potential distraction, now in fact can lead to enlightenment. Contemplation of poetry, provided that it is done in the context of Tendai doctrine, is simply contemplation of Dharma. This same thing can be said of other forms of art. Therefore, it is possible to construct an aesthetic that is not in conflict with Buddhism. Ryōgen is known generally by the names of Gansan Daishi (left) or Tsuno Daishi (right). The figure of Tsuno Daishi (Horned Great Master) is said to be a portrait of him subjugating vengeful ghosts. Gishin - Second zasu (座主, "Head priest") of the Tendai School, who travelled with Saicho to China and ordained alongside him. Ennin - Saicho's successor, the first to try to merge esoteric practices with exoteric Tendai School theories (this merger is now known as "Taimitsu"), as well as promote nembutsu. Enchin - Gishin successor, junior to Ennin. 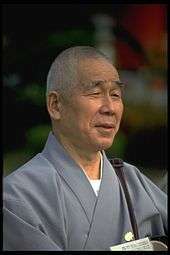 The first to successfully assimilate esoteric buddhism to Tendai, and a notable administrator as well. Annen - Henjō (Ennin's disciple)'s successor, junior to Enchin. An influential thinker who's known having finalized the assimilation of esoteric and exoteric buddhism within Tendai School. Ryōgen - Annen's successor, and skilled politician who helped ally the Tendai School with the Fujiwara clan. Enryaku-ji, the headquarters of Tendai Buddhism on Mount Hiei. ↑ Abe, Ryuichi (1999). The Weaving of Mantra: Kukai and the Construction of Esoteric Buddhist Discourse. Columbia University Press. p. 45. ISBN 0-231-11286-6. Chappell, David W. (1987). 'Is Tendai Buddhism Relevant to the Modern World? ', Japanese Journal of Religious Studies 1987 14/2-3, pp 247–266.